You can access Player.me&apos;s in-game HUD by pressing the assigned hotkey (Ctrl+Tab by default). To use this feature, In-game HUD must be enabled. You can do this by going to the Settings icon, then under the In-Game HUD tab > General, make sure the option Enable in-game HUD is checked. Player’s in-game HUD supports most PC games that run on DirectX (9-12) and OpenGL, including some DirectX 8 games. 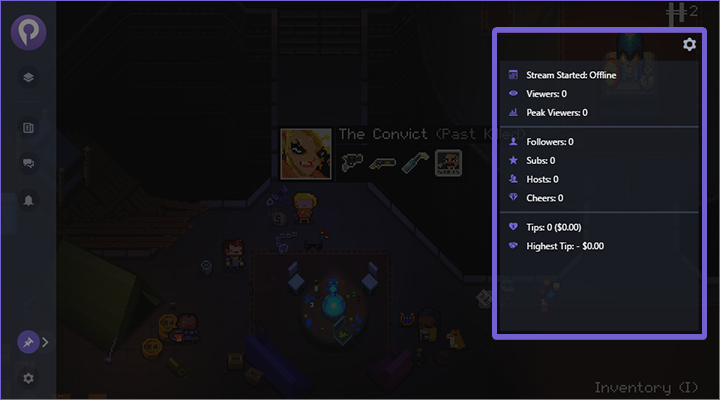 To change or add hotkeys, click the Stream Settings icon, then select the Hotkeys tab and click the Add a Hotkey or edit the current hotkeys by clicking the box next to each action and entering the hotkey you want. Accessing your in-game overlay for the first time will take you to the Create Hub. 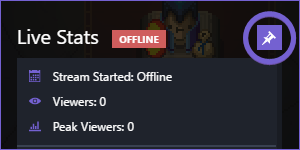 Stream Chat - Shows your stream chat from your currently linked service. 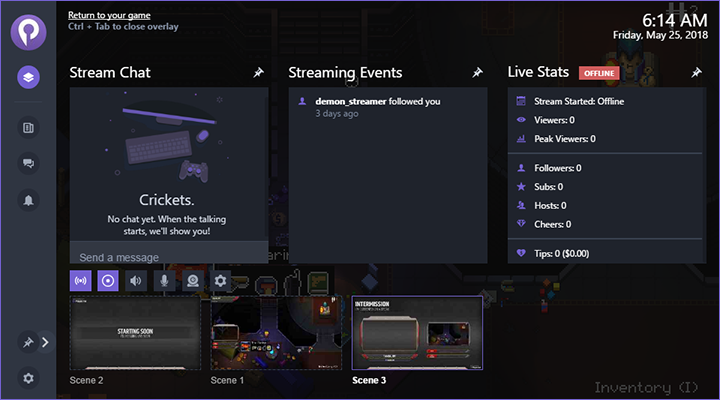 Stream Events - Displays events from your currently connected linked service, useful for checking historical follows, subs, hosts. Live Stats - Displays the status of the current streaming session. Clicking the Pin icon will add the widget to the in-game HUD. Stage Controls - This panel allows you to Stream, Record, and adjust your audio, set devices, and access Stream Settings. Scenes - Displays the scenes from the currently selected Set. Clicking on any of the Scenes will present it on the stage. Time & Date - Displays system time & date. Pinning widgets allow you to see the widgets in-game and is especially useful for keeping track of your chat, events, and/or stats without losing focus on your game. In the Create Hub, by clicking the Pin icon next to a widget. By clicking Add Widget in the Pinned Widgets section. You can get to this section by clicking the Pinned Widgets button in the Create Hub or by clicking the Pinned icon on the left panel. Clicking the Pinned tab on the left panel displays all the currently pinned widgets. To move a widget, select it until the outline appears and drag it to the location you like. Clicking the &apos;Gear&apos; icon next to the widget will allow you to set the widget&apos;s Fade Delay, which determines how long the widget will remain on the screen before disappearing, and the Opacity, which determines your widget&apos;s transparency.